Regal Robot, Inc. creates highly themed furniture, art, decor and collectibles to bring what you love into your home and life in new and exciting ways. We produce both products and, in our Regal Robot Custom Studio, we take on private commissions, creating unique items, tailor-made to suit an individual customers’ needs, style and space. In addition to working in broad themes, we are proud to offer our line of classic, authentic Star Wars™ creations and one of a kind custom services to fans of these amazing films! 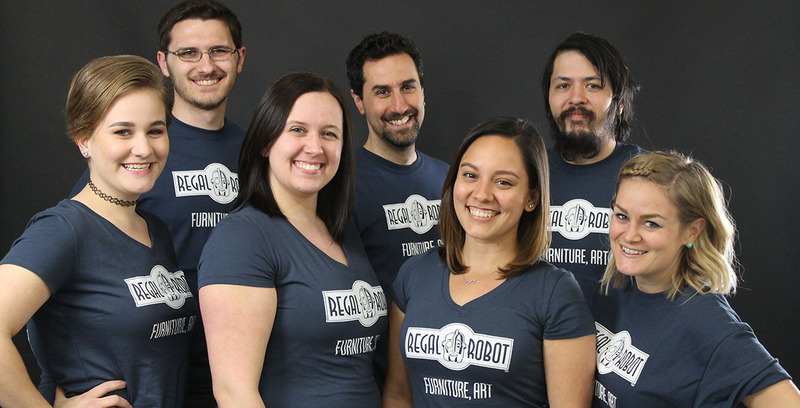 Just some of the team that brought Regal Robot™ to life. We all look forward to creating for you! That’s sort of how this whole thing started. Richard Riley and I have worked together for what seems like forever. In our work at Tom Spina Designs, we have always tried to find interesting ways to bring theming and fandom into people’s homes and lives with really unique furniture, art and decor. About 10 years ago, we created the infamous “Han Solo™ in Carbonite desk” for a Grammy award winning musician to auction for charity. The internet’s reaction showed us that we weren’t the only ones who liked this new style. In fact, it nearly broke our website at the time! Since then, we’ve had the great honor of creating for amazing companies like Disney and Lucasfilm on all manner of projects, including creating props and characters for offices, and aliens and costumes for commercials and online videos. 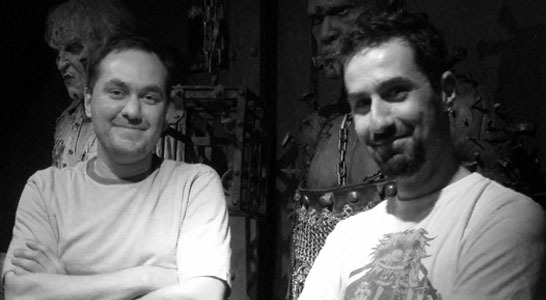 Regal Robot is the natural evolution of the work we’ve been doing for over 10 years. We honed our style and dreamt up exciting new concepts. “Wouldn’t it be cool if…” is the phrase that always signals a flood of new ideas. It’s a motto of sorts, our guide on this new journey. We’re so proud to launch Regal Robot as a place for us to share these new designs with the world. Classic Star Wars™ was the obvious choice for our first movie themed product line. Back in 1977, Star Wars changed the world, especially mine! It inspired me to start sculpting monsters and making props and put me firmly onto a creative path in life. Better still, the films offer a nearly limitless source of creative inspiration. And let’s not forget the other fans like us. These are movies we’re all passionate about, and the art direction within has been the spark in so many imaginations. Now we get to take that energy and find a way to make something more than just a product… we get to create specialized art that people can bring into their homes, their offices… their lives. And speaking of specialized, don’t miss out on the ultimate in personalization – our Custom Studio services! Through our Custom Decor and Custom Character Studios we offer the unprecedented opportunity for fans to have products developed especially for them. Don’t see what you’ve always wanted in our online shop? Submit a request today and perhaps our Custom Studio artists can create what you’ve always dreamed of, or dream up something for you. This remarkable one-on-one service is thrilling to us, and we can’t wait to see what we get to create with fans out there. Ultimately, the goal of the Regal Robot team is to always remember that anything can be an opportunity to explore what you’re passionate about. We look forward to the chance to help you bring what you love into your life and we can’t wait to say, “Wouldn’t it be cool if…” with you! And please consider sharing our work with your friends!